Johann Sebastian Bach was a German composer, organist, harpsichordist, violist, and violinist of the Baroque period. He was born in Eisenach, Saxe-Eisenach, into a very musical seven-generation family of talented composers and instrumentalists. His father, Johann Ambrosius Bach was the director of the town musicians, and all of his uncles were professional musicians. His father taught him to play violin and harpsichord, and his brother, Johann Christoph Bach, taught him the clavichord and exposed him to much contemporary music. Bach grew up surrounded by music and Lutheran church doctrine and went to St Michael's School in Lüneburg because of his singing skills. After graduating, he held several musical posts across Germany: he served as Kapellmeister (director of music) to Leopold, Prince of Anhalt-Köthen, Cantor of Thomasschule in Leipzig, and Royal Court Composer to August III. 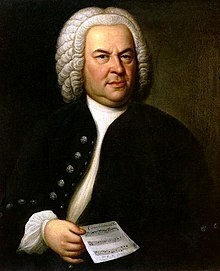 Bach's compositions include the Brandenburg Concertos, the Mass in B minor, the The Well-Tempered Clavier, his cantatas, chorales, partitas, Passions, and organ works. His music is revered for its intellectual depth, technical command, and artistic beauty. Bach's abilities as an organist were highly respected throughout Europe during his lifetime, although he was not widely recognised as a great composer until a revival of interest and performances of his music in the first half of the 19th century. He is now generally regarded as one of the main composers of the Baroque period, and as one of the greatest composers of all time.